At the most fundamental level an organization only does two things: operations and changes to operations. Regardless of the industry an organization is part of, or whether it is private or public sector, large or small, there is a constant drive to protect and improve operational aspects. 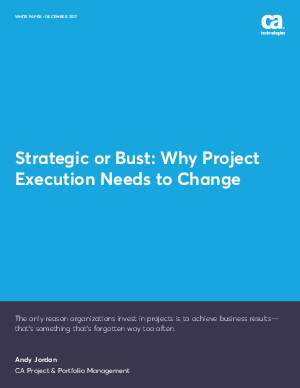 Whether it is launching a new product or service, decreasing costs, protecting infrastructure from failure or preventing regulatory noncompliance, there are numerous areas where an organization wants to change something about how it operates. That’s where projects come in. In this whitepaper we look at what causes projects to fail so regularly and offer a sustainable approach for improving performance consistently.